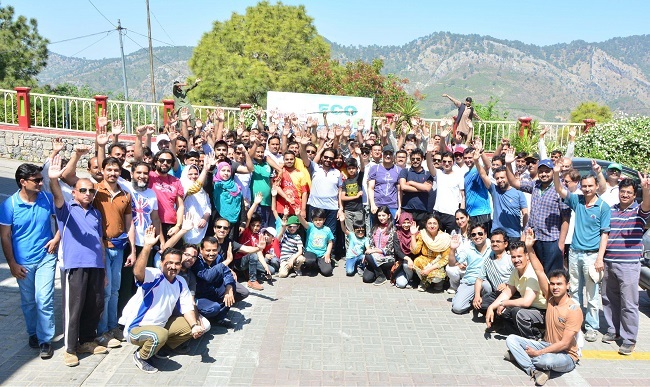 Pakistan Telecommunications Company Ltd. PTCL organized a day-long hiking trip ‘Trail 5- Eco Hike’ for its employees. This initiative was taken to combine physical activity, team building and picking trash along the way on the hiking track for eco-friendly Margallas. This activity was aimed at promoting PTCL’s One Family culture and its initiatives to take care of their health. A large number of employees belonging to all age brackets, including women, participated with enthusiasm and zeal in the activity. While hiking is a popular activity in Islamabad, it also creates a lot of trash and garbage on the hiking trails and the surrounding mountains, which is detrimental to serene environment. Such activities create awareness and behaviour change for keeping our surroundings clean and environment friendly. People belonging to all socio-economic classes, genders and ages enjoy hiking because it represents a healthy lifestyle. It was encouraging that gender balance for this activity was maintained reflecting that female employees of PTCL are also very active, aware and wholeheartedly committed to this cause.